1. Hit F8 to see all the Spaces. and drag it to another space. All the other windows from this application that are in the same space will follow! 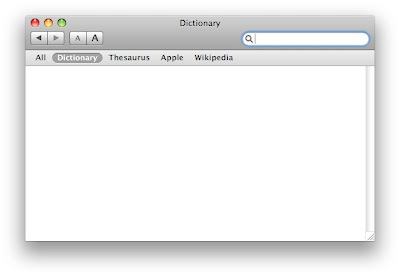 The easiest way to use Safari's new search feature! 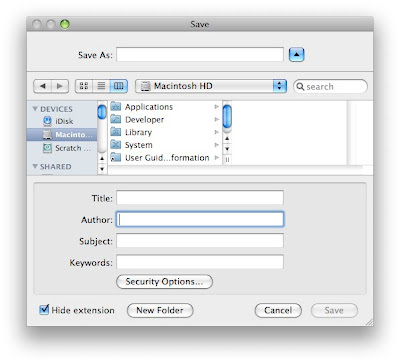 This tip works with both OS X Leopard and Tiger. Safari 3 is required with Tiger though. In previous versions of Safari and in other browsers such as Camino and Firefox, when you bring up the Find window with "Command - F", you can then get rid of it by hitting "Esc". The new improved Find in Safari 3 doesn't work in the same way. It is much better than before, really highlighting what you are looking for, but at first glance, there is no way to get rid of it quickly. There is a shortcut however. It is "Shift - Command - F". It will instantly hide the search field. Edit: Weird, "Esc" didn't work for me at first, but after people start posting about it in the comments, I tried it again and it worked. I guess I can add more to this tip. There are other shortcuts. When you do the search, the first result will be highlighted in yellow. All the other results are in white. If you want to see the next one more clearly, you can use "Command - G" to highlight the next one in yellow. "Shift - Command - G" will move backwards. Much more info about zooming in Quick Look! I posted a tip last week about how it is possible to zoom in Quick Look using "Option - Click" and unzoom with "Shift - Option - Click". It didn't work for a lot of people. I finally figured out why and I also found another way that is even faster. So the shortcut "Option - Click" only works with images such as Jpeg, Tif, etc. The even faster way of zooming in on images is to hold down Option and scroll with your scroll mouse. If you want to zoom in on a PDF, the shortcut is different. It is "Command +" to zoom and "Command -" to unzoom (it is most likely different depending on the keyboard layout you use). I really don't understand why Apple didn't choose a standard way of zooming in Quick Look no matter what you are looking at, but that's the way it is. A recent items stack hidden in the OS! 5. You can get more of these stacks by doing the same procedure again. To remove it, simply drag it off the Dock. Thanks for the tip Rohit and macosxhints.com! A great tip submitted by Dominic P. Tremblay: Dashboard when screen sharing! I always use the F12 shortcut to launch Dashboard, because I think dragging the mouse to the Dock to click on the icon is so much longer. I finally found why the icon is useful though. When you are using Leopard's new screen sharing feature, pressing on F12 will launch dashboard on your own Mac even if you mouse is in the shared screen window. The only way that I found to open Dashboard on the remote Mac is to click on the icon in the Dock. Thanks for the tip Dominic! Dragging a file from the Finder to Safari! I found this tip at MacWorld.com and I was so impressed, I had to share it with you. This tip works in both Leopard and Tiger. You must have Safari 3 installed if you are on Tiger though. When you are filling out an online form and you have to upload a file, there is often a "Choose File" button. When you click on it, you get a window similar to the open/save window where you can choose the file. You often have to go through many folders before getting to the right file. In Safari 3, it is much easier. 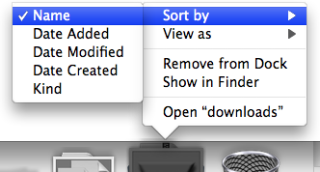 You can drag a file from the desktop or anywhere in the Finder, all the way to the "Choose File" button. Thanks for the tip MacWorld.com! Open in with the Command-Tab! Okay, I know I said in the comments I was going to have a Tiger and Leopard tip for tonight, but I had so many problems uploading the video that it is not ready. It is the kind of tip that is really ten times more obvious with a video. I hope it will work for tomorrow. 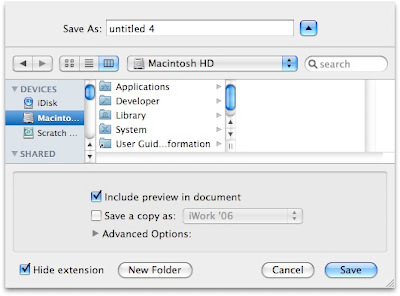 In Leopard, instead of right-clicking on the file to choose "Open With", you can easily drag the file to a currently running application in the "Command-Tab" dialog. To do this, you first click and hold the file as though dragging it. You then bring up the Command - Tab and once it appeared, you drag the file to the application you want to force the OS to open it with. This is useful, because when you drag it to the Dock, it is often not recognized as a recommended application, but Command - Tab won't check that. Customizable grid spacing on the Desktop! This is a Leopard only tip. 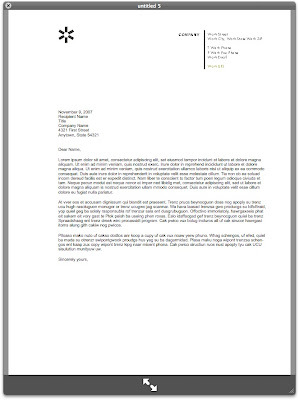 There is no obvious way of zooming in when checking out a pdf or an image in Quick Look. It is possible however. 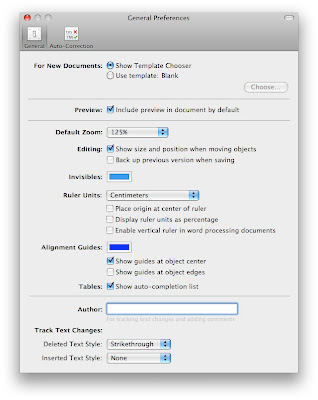 To do so, simply open a pdf or an image in Quick Look, hold down "Option" and click anywhere on the file. To zoom out, use "Shift - Option - Click". It also works in full screen. It is very useful because I thought at first that there was no way to see it bigger than full screen. 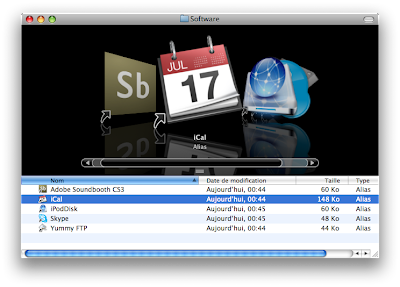 What is wrong with the Finder Coverflow! What do you think? Is it a bug or a feature? 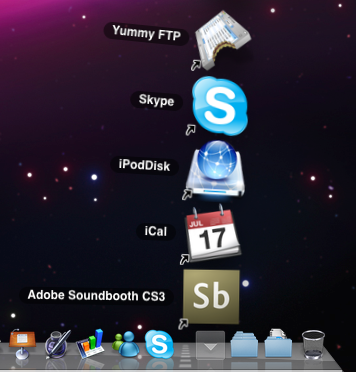 An unknown way of adding an application to the Dock! Okay, that seems like an easy thing to do, but there is a much quicker way than the way most people do it. The two ways most people use to add an app to the Dock is to either drag it from a Finder window to the Dock or click and hold its icon in the Dock (when it is loaded) and choose "Keep in Dock". I previously used the slow "click and hold" method. The way that works much better is to simply move the icon to another place in the Dock when it is loaded. It will automatically add it to the Dock. Stacks was presented as a new Leopard feature, but it is really a polished version of what was already in Tiger. It did get some improvements: you no longer have to click and hold, the overall look is better, etc. It also lost a feature however. It is no longer possible to browse through the folders in a hierarchical way. There is a new application called HierarchicalDock that modifies this behavior and lets you go back to a more Tiger-like way of handling stacks. You can download HierarchicalDock here from MacUpdate. Sorting color labels in the Finder! 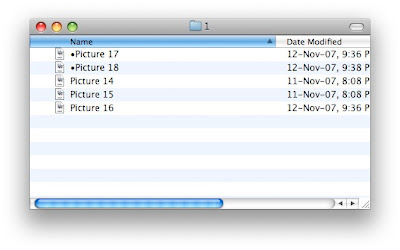 In the Finder, you can sort files by Name, Date, Size, Kind, etc, but there is no way of sorting both by name and color labels. I think that could be very useful. I could add a color label to the edited files and have them move to the top by default. There is a way of doing something similar though. It is by renaming the files with a symbol in front to make them go to the top. I find this useful, but I think it always looks odd with the weird symbol. I finally found a symbol that makes sense however. On the US keyboard, you can get it with "Option - 8" and it is "•". What really makes me like it is that it is the same symbol than the one that goes besides new podcasts in iTunes. With this, I get two alphabetical lists, the one with the symbol and the one without. Changing the look of your Dock! 3. Right-click on "Dock" and select "Show Package Contents". 5. Backup the file you are about to replace in case you want to go back to the original Dock style. You can do this by comparing the files you downloaded to the ones in this folder. 6. Move the files you downloaded to that folder. 7. Open Terminal and enter "killall Dock" (without the quotes). 8. View your new dock! 1. Click on the stack to open it. 2. Click and hold on the file. 3. Drag the file from the stack to the icon of the application on the Dock. 4. If the application becomes highlighted, it will open it without a hitch. If it doesn't, it means that the application is not a recommended application for this type of file. 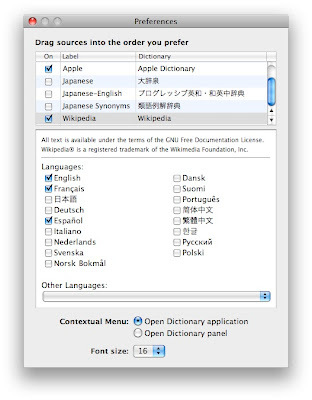 It is possible to force it to open the file by pressing "Option - Command". By the way, Apple released many updates today. Updates are available for OS X 10.4 Tiger, iPhoto '08 and Final Cut Studio 2. 2. 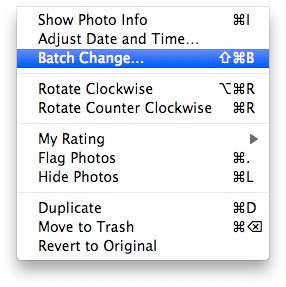 Go to "Photos" and choose "Batch Change...". 3. Select if you want to change the title or the description. When changing the title, a necessary option is there. 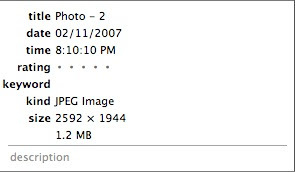 It is "Append a number to each photo". Here is the result. One thing that I really like about Quick Look is its tight integration all through the system. 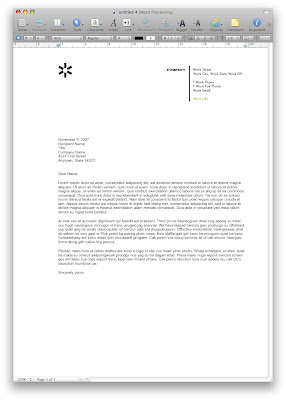 It is even possible to highlight an attachment you received, hit spacebar and navigate through it in Quick Look. 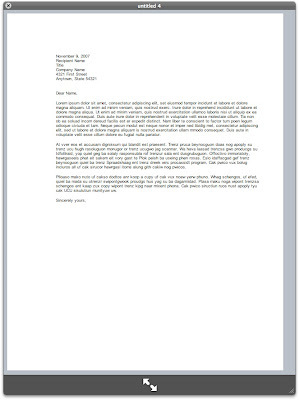 I sometimes wish the same was possible with an email I am sending and with Notes. There is a way of getting similar results though. Highlighting it and hitting spacebar doesn't work, because it is in edit mode, so it replaces the file with a space. 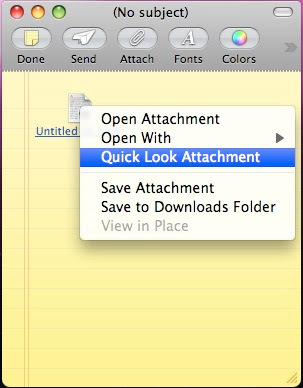 The way you can do it is by right-clicking on the attachment and choosing "Quick Look Attachment". I already mentioned a feature that lets you go anywhere in the path of a folder in the Finder. 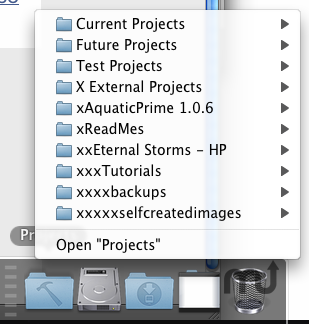 It is by holding down "Command" and clicking on the title of the folder in the Finder window top bar. The path pops up and you can choose exactly where you want to go back. Once the path pops up, whether you keep on holding Command or not in Tiger, the result is the same. It redirects you to the folder that you chose. In Leopard however, you have to release the Command key before selecting where you want to go or it will open it in a new window. I think the way it works in Leopard makes more sense, at least you have the choice of getting it in a new window or not. I just wasn't used to it and I kept getting new windows, but now I know! I received many of these by emails from many different people and also through the comments. I won't name everyone, because it would just be too long. So basically, it is a few more ways of using Spaces more efficiently. The F8 shortcut is flashy, but I find it too slow to be useful in a workflow. That's why I really started liking Spaces when I realized I could switch space by switching application with Command-Tab. So here are a few ways of moving an application from one space to another without resorting to F8. 1. You can take the window of an application and move it to the edge of your screen. It will bring the application in the next space (if you bring it to the right edge, it will move it to the next space at the right). I really liked it when I found it, but I like the next one even better because it doesn't require as much use of the mouse. 2. The other way is to click and hold the window of the application and switch to the other space using the "Ctrl - 1", "Ctrl - 2", etc (the number corresponding to the number of the space you want to go to). The application will follow.